Last weekend when I had the meet up with other nail girls and played with water marbling, this was the design I had in my head that I really wanted to create. 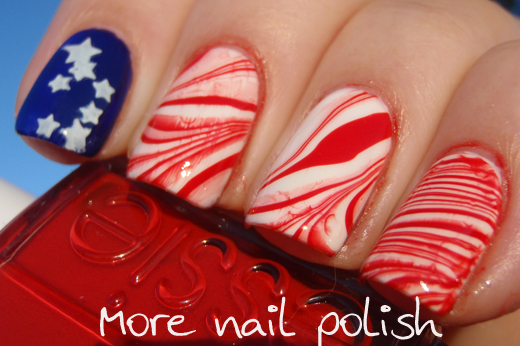 Let me tell you, this took me lots of goes, not because the water marbling didn't work but because I found it really hard to get red and white to water marble together without mixing into pink. I think this was about the 5th combination I tried. I tired three different red polishes and found the best results with Essie Red Nouveau. It's a orange toned red rather than a pink toned red and I think that made a huge difference The other thing that made a huge difference, which @lilyandjinks suggested, was to use a sheer clear polish rather than white. Every time I used white, the red bled into it. The polish I used was Essie Pillow Talk and it worked a treat. On my index finger I used one coat of OPI Eurso Euro - wowsers, that's a nice polish! I then stamped some stars using a nail image plate I borrowed off Julia aka Messy Mansion stamping plates. Other than my white gel base, I don't think any part of this mani was created with my polishes or supplies. Thanks ladies!! I had about the same idea to get some stripes with red and white. I used China Glaze With Love and Nfu Oh NFU 01 (white). Worked ok. Earlier I've used OPI Don't Touch My Tutu! when I wanted a white. 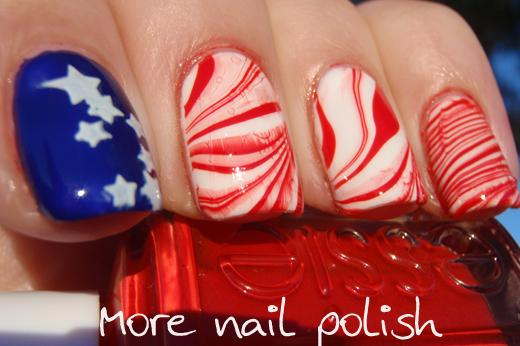 In both cases I used white as base polish for the marbling. 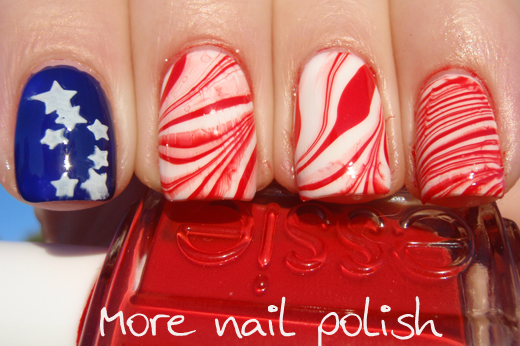 This might be the cutest 4th of July mani I have seen yet!